Fits waist of up to 40"
According to the Minnesota band… pockets in your pants are just boring, especially when man came up with the glorious invention, the fanny pack. Those are amazing. They fit around your waist and you can place whatever you want inside of them. You could put your cell phone and your cash inside. You could put a granola bar inside. Heck, you could even fill it to the brim with marbles, since you never know when you’re going to need a handful of marbles. And what luck! We happen to have this 80s inspired fanny pack right here. 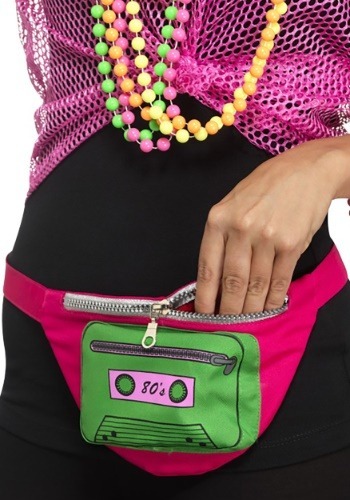 This 80’s fanny pack has a zipper on top, so you can safely secure your items inside. It also has a cassette tape design on the front, harkening back to the golden age of cassette decks. Just strap it around your waist and let the good times roll! So cute, and I won’t have to carry a purse on Halloween.